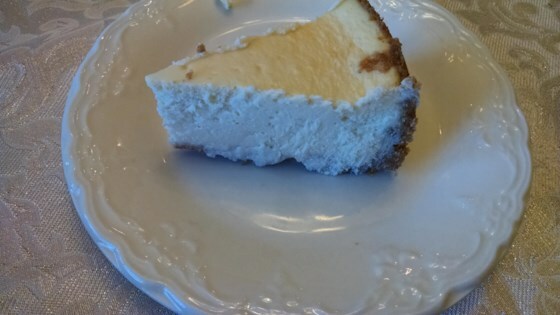 "This cheesecake is truly five star rated and those that eat it will certainly agree it's the finest ever made. It's good enough to just make one every week so you can have it around when you want that something special to nosh!" Preheat oven to 375 degrees F (190 degrees C). Wrap the outside of an 8 inch springform pan with foil. Generously butter the inside of pan and sprinkle with graham cracker crumbs, then shake out excess. In a large bowl, Beat cream cheese and sugar on low speed until smooth. Beat in heavy cream, sour cream and half-and-half. Add vanilla and beat in the eggs one at a time. Pour filling into prepared pan. Wrap bottom of the pan on aluminum foil to prevent water from seeping in. Place cheesecake in a water bath. Bake in the preheated oven for 75 minutes, or until filling is set. This is the best tasting cheesecake. I added two tablespoons of Grand Marnier and grated some orange zest on the top. Also a sprinkle of allspice.. Followed recipe exactly and loved it! I actually prefer the crust over the traditional crust. Only difference is that it only took about 45 minutes to bake. Thanks for the recipe! Excellent creamy cheesecake recipe! I added a blueberry topping to the last one I made with fresh blueberries and it was outstanding! So easy and ohhhhh so good.